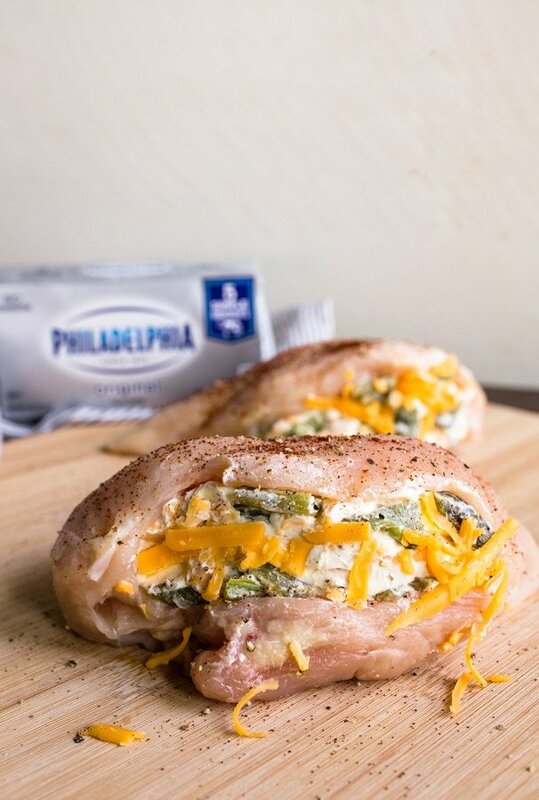 Cheese stuffed chicken breast with Hatch green chiles, sharp cheddar, and cream cheese is so flavorful with such few ingredients! If it seems that I slipped and fell into a roasted green chile patch, well, I did. While I resisted the 25-pound box at the market, I did fall for the 5-pound package of fresh roasted Hatch green chiles. We’ve been making green chile chicken stew. We’ve been making my turmeric macaroni and cheese with a 1/2 cup of green chiles stirred in. And now, we’re making cream cheese stuffed chicken breast with chiles and sharp cheddar! I just can’t help myself when a grocery store goes above and beyond to roast fresh chiles for me! I’m a picky grocery store shopper, and after I scan the produce section, I hit the frozen food and dairy aisles. I rely on refrigerated and frozen foods to round out my weekly meal plan. 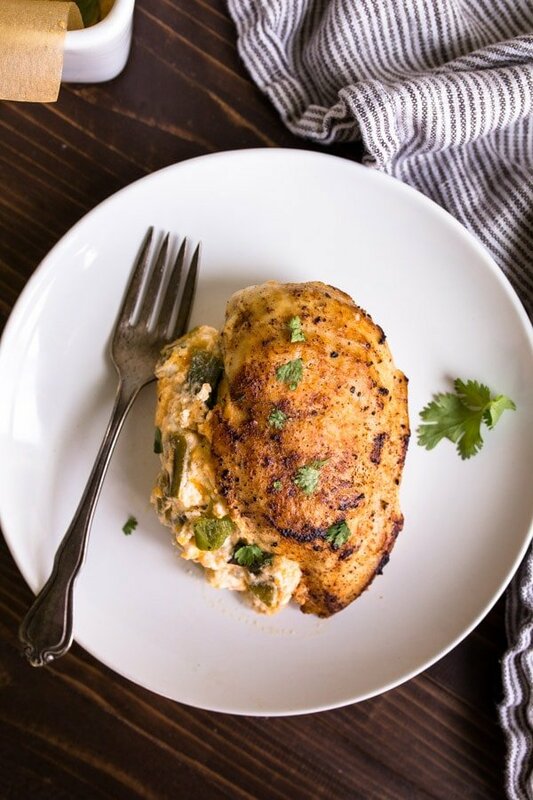 Since spicy green chiles were in almost every recipe for the week (including this green chile cheese stuffed chicken breast recipe), I grabbed some cream cheese to cool things down. My family goes through at least 2 packages of cream cheese a week. My daughter loves it on bagels, I love making a quick veggie dip with it, and it’s the foundation of one of my most popular recipes: engagement chicken pasta. Cream cheese is one of my favorite dairy products to use to bring creaminess and tanginess to a dish, and I love that Philadelphia Cream Cheese only has 5 simple ingredients. It’s just milk, cream, salt, a thickener, and cheese culture. So simple, and so good! First, be careful not to cut all the way through your chicken breast–just cut a slit or pocket for stuffing. Instead of aiming for the middle when slicing your chicken breast open, aim for cutting it about one-third of the way from the top. The lower two-thirds of the chicken will help hold the filling inside. See the photo for reference. Yes, some of the cheese mixture might leak out of the chicken while it bakes. Let it cool for a few minutes after it comes out of the oven, and then push it back in place. 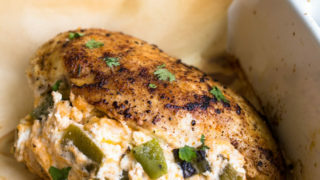 I recommend cooking this baked stuffed chicken breast recipe in a non-stick, oven-safe skillet. If your skillet isn’t oven-safe, you can transfer the chicken to a baking dish that is lined with parchment paper after searing it on the stove. 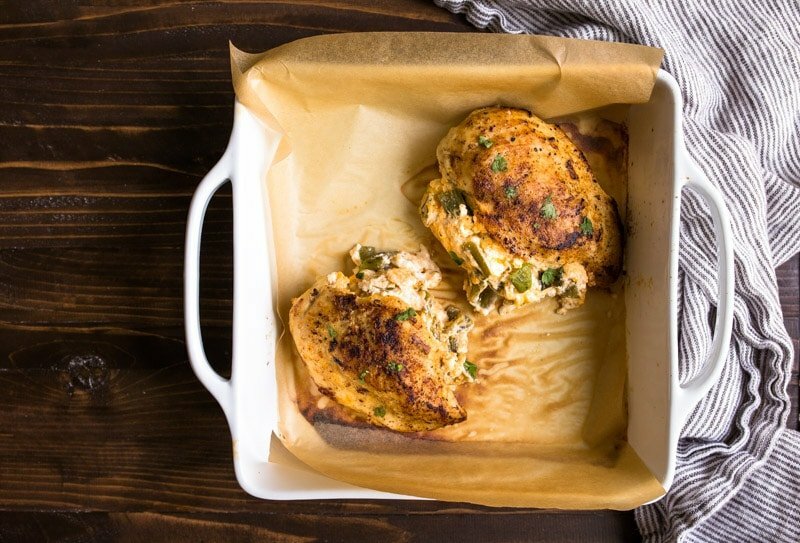 Can you freeze this baked stuffed chicken breast recipe ahead of time? Yes, you can absolutely stuff these chicken breasts, wrap them carefully in plastic wrap, and freeze for future use. They take nearly 24 hours to defrost, so pull them out the night before you want to bake them. They might take a few extra minutes in the oven if the center is still frozen, so use a thermometer to ensure they reach 165-degrees Fahrenheit before serving. 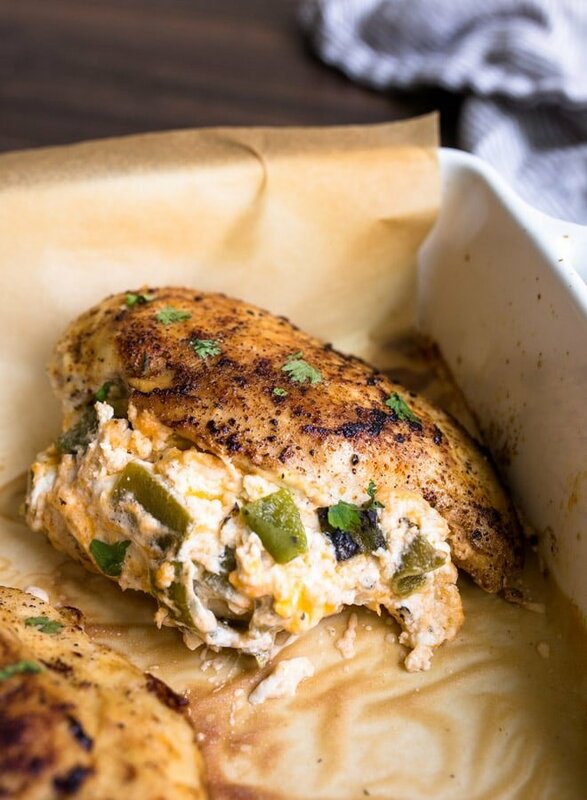 I used green chiles labeled ‘spicy’ because it makes these cheese stuffed chicken breasts taste like a big jalapeño popper, but if spicy food isn’t your thing, use mild chiles. This dish is great either way, honestly. It’s hard to decide exactly how many servings this recipe makes. It uses two large chicken breasts, but I like to split one of these cheese stuffed chicken breasts with my husband. They’re great leftover, though. For a side dish, I like rice cooked with even more chiles and cilantro, or a light salad. 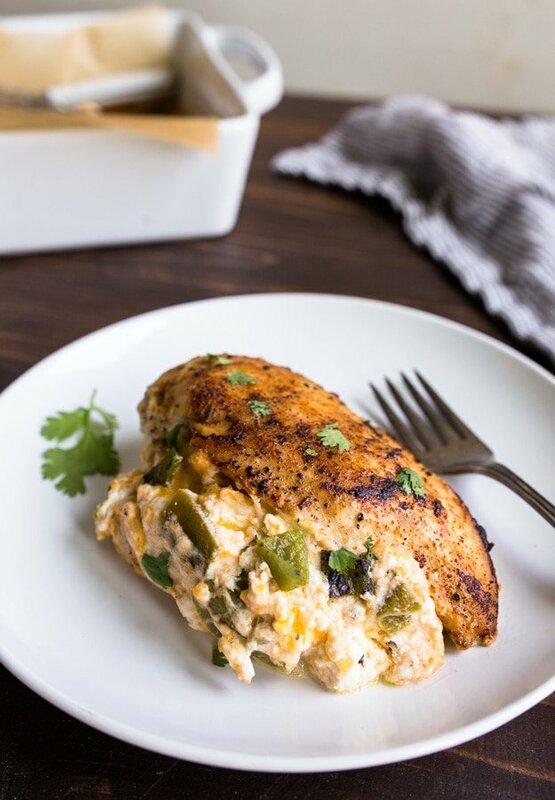 Cheese stuffed chicken breast with cheddar, green chiles, and cream cheese. Serves two. Preheat the oven to 425. If your skillet isn’t oven-safe, line a small baking dish with parchment paper. First, using a small sharp knife, cut a pocket in each chicken breast. Aim about one-third of the way from the top of the breast, and cut horizontally, being careful not to cut all the way through. Repeat with the other chicken breast. 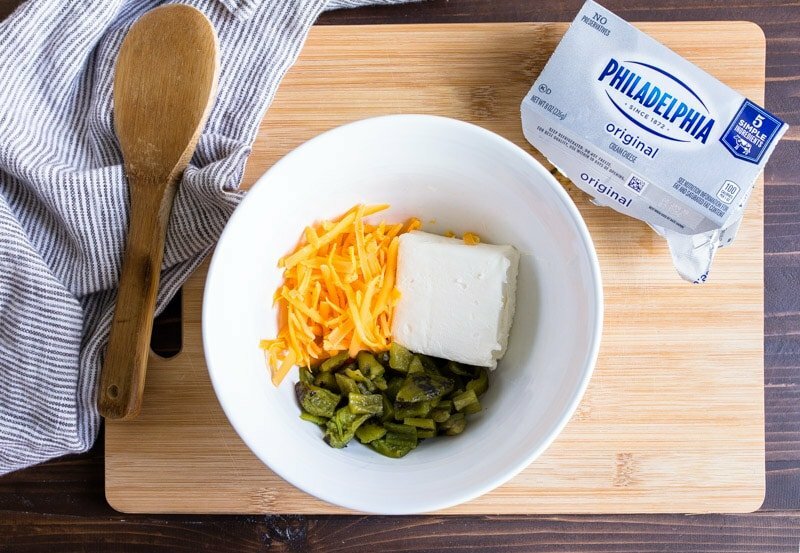 In a medium bowl, stir together the Philadelphia cream cheese, chiles, and cheddar. Stir very well to break up the cream cheese. Add a big pinch of salt and a few grinds of black pepper and stir again. Divide the cream cheese mixture in half, and stuff each into the pocket you cut in the chicken. You can use a toothpick to pin the chicken closed, but it doesn’t matter too much. Sprinkle the top of the chicken breasts with salt, pepper and chipotle powder (if using). In a small non-stick skillet, melt the butter over medium-high heat. Place the chicken top-side down, and sear for 4-5 minutes, until a golden-brown crust forms. While it cooks, season the bottom of the chicken breasts in the pan with salt, pepper and chipotle powder. Flip the chicken and cook on the other side for 4-5 minutes. Move the skillet to the oven (if your skillet isn’t oven-safe, gently move the chicken breasts to the oven dish). Bake for 10 minutes, and test the temperature in the thickest part of the chicken—it should register 165-degrees F. If not, return to the oven for 3-5 minutes more, and test again. Let the chicken cool in the skillet (or pan) for 5 minutes—this helps the filling somewhat solidify and makes it easier to serve. If the filling melted out of the chicken breast, push it back into place, and serve. What’s not to love about stuffed chicken breasts! I mostly use fresh ricotta for my fillings (with any sort of veggies and, tomato sauce and cheese basically ) but cream cheese sounds a great choice too. I will try this one next time I have some checking breasts in sight for dinner. I bet the tangy flavour of cream cheese gives a nice touch. I have to say agin… I LOVE your cream cheese ideas so much. Actually your engagement chicken pasta sauce has become a go-to in our home, specially with well….pasta, of course. I have also added it once to a bowl of leftover steamed rice and it turned out pretty good too, almost rissoto kinda side dish. Everyone liked it! I am SO excited about this recipe . . . I just roasted some Hatch chiles last weekend (so happy to find them in Minnesota!) Definitely going to make this next week! I made this last night for supper. Awesome and so easy. My husband loved it. Another great recipe for us empty-nesters! Made these last night for dinner. Amazing! So easy and yummy! Definitely a keeper! I want to try this recipe tonight… Thinking aboit adding pieces of bacon to the filling. Any thoughts? I Feel as the same the same as you , Chicken breast han get so plain sometimes. I uselly Stuff with vegetable, I have to try your recipe .